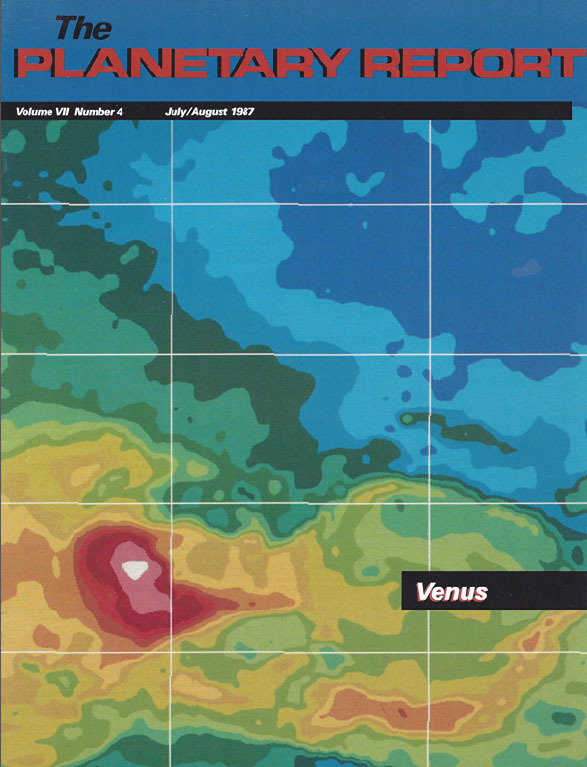 On the Cover: Venus' highest mountain, Maxwell Montes, appears in this new map compiled from data returned by the Soviet Venera 15 and 16 orbiters. The main mountain (shown here In red and white) is part of a tectonic mountain belt and spans about 1,000 km from north to south. Maxwell Montes rises 11 km above Venus'mean surface; Earth's tallest peak, Mauna Loa, is only 8 km above the Pacific Ocean floor. Tying strips of altimetric data together to produce this preliminary map was an arduous task; elaborate image enhancement and radar-image mosaics will be completed later. 4 Auroras at Venus? Taming the Venus Dragon: Harry Taylor asks: Are volcanoes still erupting on Venus? 6 Lightning on Venus—An Alternate View: William Borucki offers an opposing argument. 7 How the Planetary Sciences Struggle Toward the Truth: James Burke discusses paradigm shifts in the field in the 20th century. 8 Eighteen Months of META: A Status Report on The Planetary Society's SETI Project: Paul Horowitz gives an update on this exciting project. 12 A Space Station Worth the Cost: The Planetary Society Proposal: Carl Sagan, Bruce Murray, and Louis Friedman gave this testimony before The Senate Appropriations Committee on May 1, 1987. 3 Q&A Why don't we feel how fast the Earth is moving through space? 11 News & Reviews Selling CRAF. 14 Society Notes SETI, Halley's Comet, and inventing aliens.